The Church, as it is commonly known, is a modern-day jewel encased in vintage design. It pairs the elegance of custom architecture with the convenience of a two-car, underground parking garage. 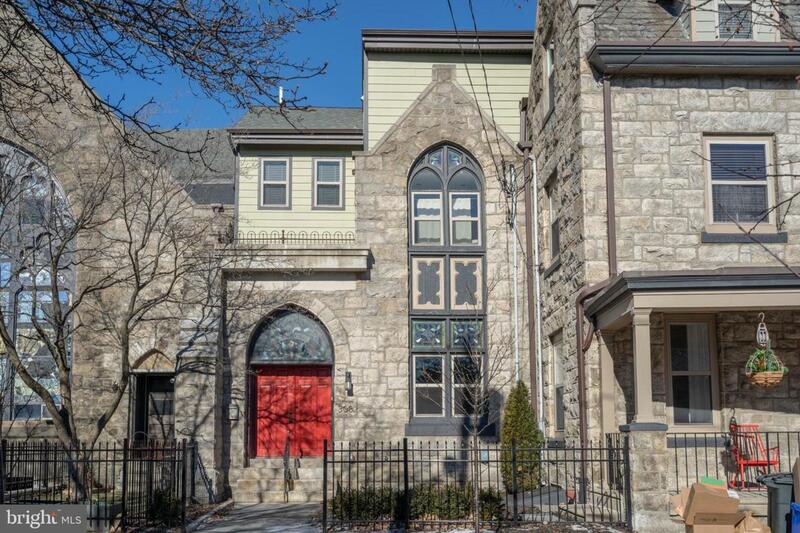 Original stone masonry and stained-glass windows greet you at the front door. A custom chandelier designed by world-renowned Warren Muller welcomes you to the foyer. Enter into the spacious and open-concept entertaining area with living room, kitchen, and enclosed patio. The open layout is subtly punctuated by a series of Middle Eastern pointed arches leading to a custom, high-end gourmet kitchen recently renovated with no expense spared and large enough to accommodate all of your entertaining needs. Marble countertops stretch the length of the kitchen and top the massive island with plenty of room for seating that stretches the length of the kitchen and features a farmhouse apron front basin and wet bar sink. Across from the island is a hidden coffee and cocktail station with cabinet doors to conceal the contents and a drawer microwave convection oven combo. Two Wolf commercial five-burner gas stoves are set against a beautiful backdrop of geometric tile complete with a pot filler faucet and a custom cabinet chef~s range hood. A second Warren Muller light fixture hangs above the island along with additional recessed lights. A Subzero refrigerator and separate wine chiller ensure that guests will never leave unsatisfied. Triple French doors with transoms lead to the slate covered courtyard patio reminiscent of an Italian villa. The Moroccan tile from New York City's famous Mosaic House can be found on the floor and backsplash of the kitchen and on the surround of the decorative fireplace. The living room is brightly lit with natural sunlight from windows that contain the original stained glass of the church. Soft illumination beams down from the stunning trayed ceiling. Walnut flooring adds warmth to the sitting area, and the decorative fireplace clad in imported Moroccan tile will spur conversation between your guests. Throughout the first floor, you will find custom trim, woodwork, and architectural details unlike any home in the area. As you walk up the staircase, a sense of serenity comes upon you. You are greeted by a cozy sitting area, with French doors to a second-floor balcony, perfect for your morning coffee or evening nightcap. Your master bedroom awaits you with a balcony overlooking the private, Roman-inspired patio with curved exposed-brick architecture and open windows. The master bath blends privacy and functionality with a glass-enclosed shower, oversized soaking tub, and separate water closet. A double sink and built-in vanity complete the modern look. Marble subway wainscoting covers the majority of the walls. Risers to the third floor are illuminated with under-lighting and lead you to three guest bedrooms with a full bath and laundry closet. The skylight sprays a burst of natural light on the landing, even on the cloudiest of days. One of the bedrooms has a sitting area that could function as an au pair or in-law suite. Your guests~ bathroom is no less elegant than the master bath with double vessel sinks and marble tile throughout. A full-size washer and dryer set are included and neatly tucked away in a closet for convenience. For all its antique design, the Church is replete with modern-day, energy-efficient amenities. The house is outfitted with central air and a tankless water heater to save on utility costs. You can escape the stress of Manayunk parking with a gated, underground lot that fits two cars. City living mixed with antique luxury and modern-day conveniences. You will also enjoy six years of significant tax savings from the current tax abatement. The house and renovation have been featured in Philly Magazine, Elle Decor, HouseBeautiful.com, and Hidden City Philadelphia. You are sure to impress everyone who walks through your door!